Dogs are always a great way to interest young readers in a story, maybe this dog can help interest them in history. 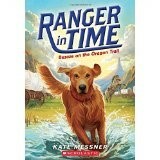 In this new series by Kate Messner, Ranger is the dog who travels in time. The first adventure takes Ranger and his readers on the Oregon Trail. Amid the dangers of rattlesnakes and flooding streams, readers also get an authentic feeling for the endless days of walking beside the wagon. It was hard to realize that friends, family and everything you have ever known is getting farther and farther behind you. Meantime up ahead is land, weather and people you know nothing about. There is hope, but no sure things ahead nor on the trail. The portal that allows for Ranger’s travel abilities is a metal first aid box that seems to hum and vibrate when a trip is about to begin. While a grown up reader might question the red cross on the metal box, young readers will suspend their disbelief and set off on the next adventure. Full page illustrations are full of action as well as historically accurate. Kate Messner makes the characters real. They feel like friends you have known for a long time before the story ends. Historical fiction, even with a touch of time travel, can help teachers and librarians meet the standards of the core curriculum in geography, American history, cultural beliefs, literacy and math. This story includes a fascinating explanation of how people used to measure the distance traveled during a day on the wagon trail. Parents might want to read this book aloud to children before taking a vacation to a place related to the Oregon Trail, or just to enjoy a good story together chapter by chapter. Readers will enjoy collecting this new series and taking other trips with Ranger. His next adventure will take him to ancient Rome.